By Amy Sherman on Wednesday, December 20th, 2017 at 6:30 a.m.
A newly elected mayor in New Jersey has banned the word "Christmas" at government functions, prompting an angered man to toss a souffle at his head, a fake news article proclaimed. "Breaking: Muslim New Jersey Mayor just banned the word ‘Christmas.’" stated a Dec. 16 headline on the Last Line of Defense, a fake news website that identifies itself as satire. Facebook users flagged the post as being potentially fabricated, as part of the social network’s efforts to combat fake news. There is no such ban on the word ‘Christmas’ by Mayor-elect Ravi Bhalla. Bhalla, a city council member and lawyer, was elected mayor Nov. 7 out of a field of six candidates. He will be officially sworn in Jan. 1, 2018. The previous mayor, Dawn Zimmer, decided not to run again. 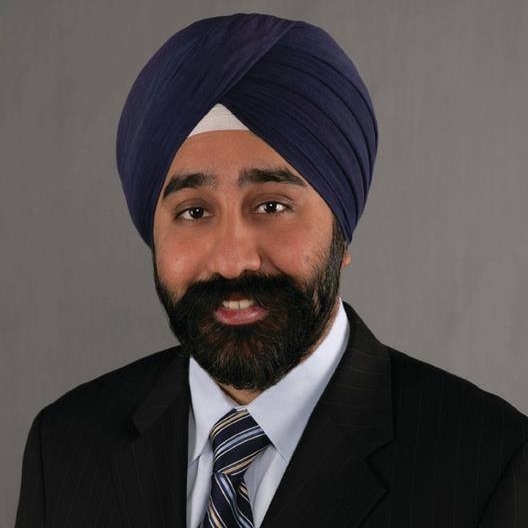 Bhalla will be the first Sikh mayor of Hoboken. During the election, a flier with the phrase "Don't let TERRORISM take over our town" above a picture of Bhalla appeared on car windshields. The Last Line of Defense article stated that Bhalla received a Christmas gift from Zimmer: a chance to make one mayoral decree at the annual Christmas gala at the Patrick C. Farley Community Center at 5th and Brussels. The two politicians shook hands and then "Bhalla shocked the roughly 200 citizens in attendance with his decree that "the word ‘Christmas shall not be said at government functions,'" the article stated. Apparently that didn’t sit well with one man in the audience, according to the website which used a quote allegedly from the Hoboken Journal. "The crowd began to boo loudly and one man was escorted out after throwing a souffle at Bhalla’s head, knocking his turban off. Eventually, things returned to normal but there was a sense of displeasure the rest of the evening." We searched the website of the Hoboken Journal, a blog, and found no such quote. The Last Line of Defense article then stated that the "war on Christmas has gone on long enough." "If Mr. Bhalla doesn’t like it he can go back to his home country of IDontGiveAFuckistan and leave Americans to be Americans," stated the article. Hoboken spokesman Juan Melli said that the only truthful part of the article is that Bhalla will become the mayor in January. The photo accompanying the article is of Bhalla and Zimmer in front of City Hall. "Everything else is garbage," Melli told PolitiFact. "I don’t know how else to put it." There was no Christmas gala (there was a Christmas tree lighting that was indeed open to the public). Also there is no intersection of 5th and Brussels in Hoboken. And Bhalla isn’t Muslim -- he is a Sikh. Bhalla, a child of Indian immigrants, was born in New Jersey. Melli said that he sent the fake news article to Bhalla and that the mayor-elect laughed. A headline stated that a "Muslim New Jersey Mayor just banned the word ‘Christmas.’" Bhalla, the mayor-elect of Hoboken, didn’t ban the word ‘Christmas’ and he is not Muslim. Published: Wednesday, December 20th, 2017 at 6:30 a.m.